Film: 6 min 40 sec, digital 4K, 25fps, stereo. Installation: Digital projection, 3 x 16:10 screens, each 4.85m x 2.8m. Medium: Digital photography, photogrammetry and 3D animation. Internet machine (showing now at Big Bang Data or watch the trailer) documents one of the largest, most secure and ‘fault-tolerant’ data-centres in the world, run by Telefonica in Alcalá, Spain. 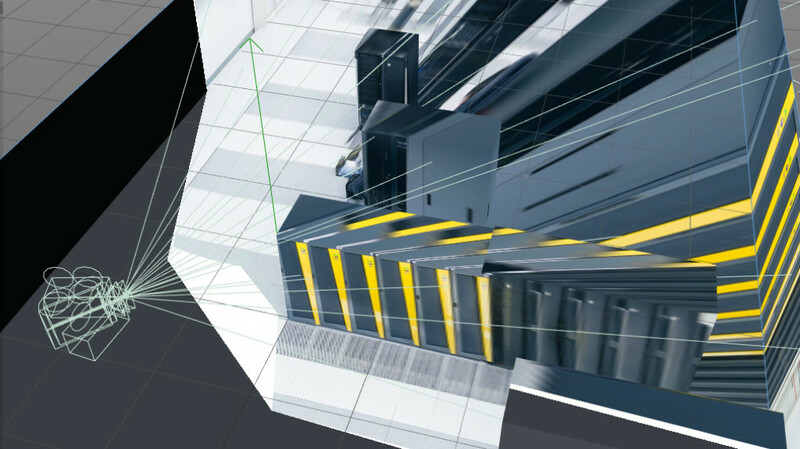 The film explores these hidden architectures with a wide, slowly moving camera. 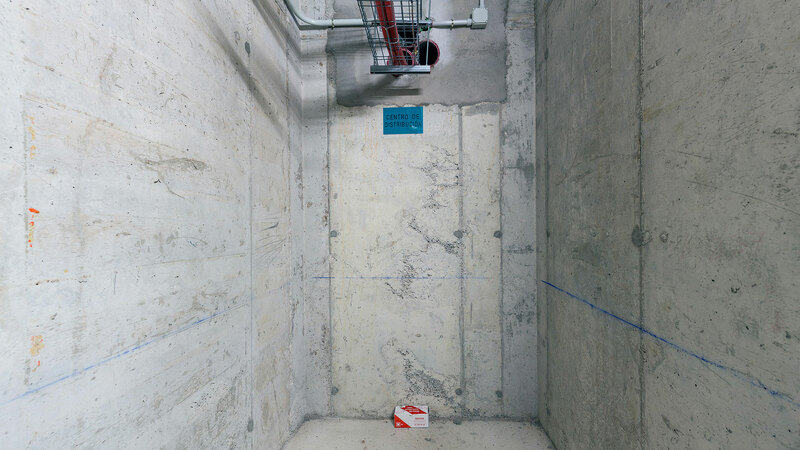 The subtle changes in perspective encourage contemplative reflection on the spaces where internet data and connectivity are being managed. What we find, after being led through layers of identification and security far higher than any airport, are deafeningly noisy rooms cocooning racks of servers and routers. In these spaces you are buffeted by hot and cold air that blusters through everything. 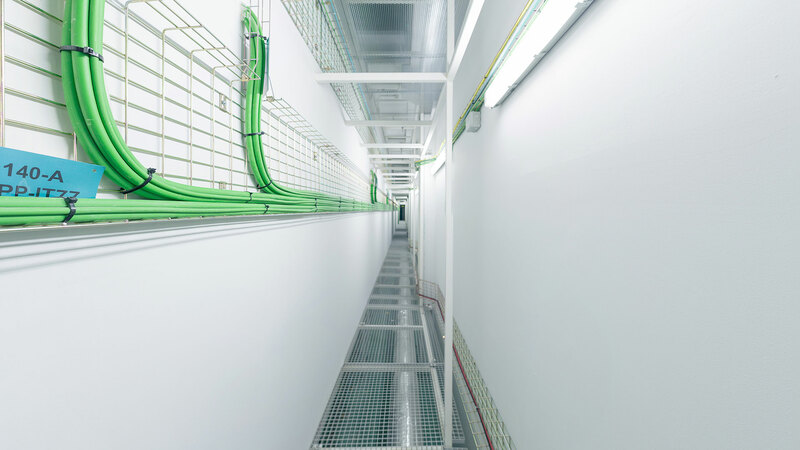 Server rooms are kept cool through quiet, airy ‘plenary’ corridors that divide the overall space. There are fibre optic connections routed through multiple, redundant, paths across the building. 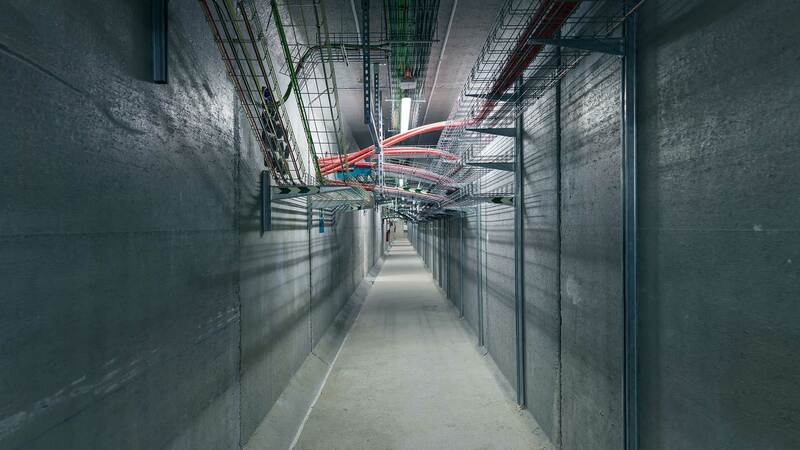 In the labyrinthine corridors of the basement, these cables connect to the wider internet through holes in rough concrete walls. Power is supplied not only through the mains, but backed up with warm caverns of lead batteries, managed by gently buzzing cabinets of relays and switches. 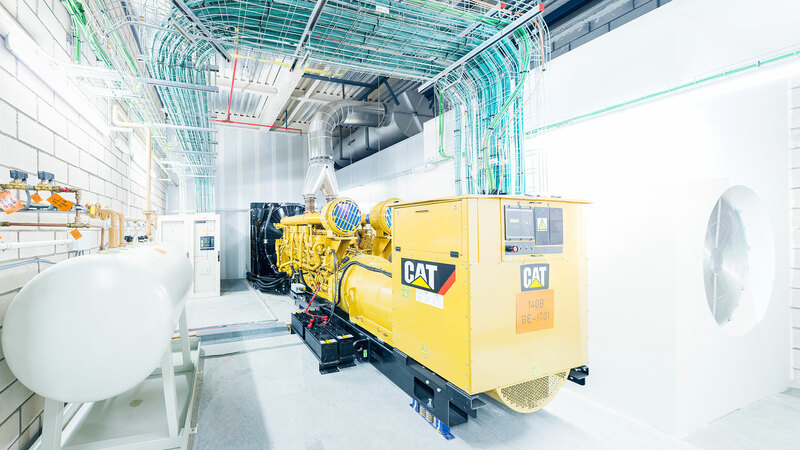 These are backed up in turn by rows of yellow generators, supplied by diesel storage tanks and contracts with fuel supply companies so that the data centre can run indefinitely until power returns. 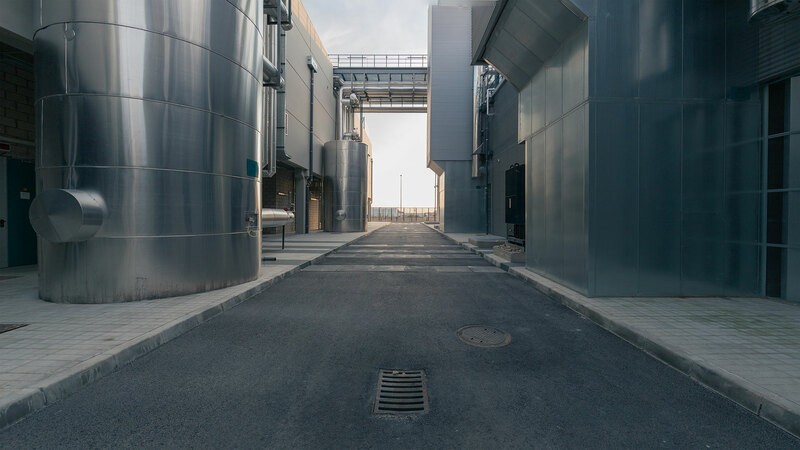 The outside of the building is a facade of enormous stainless steel water tanks, containing tens of thousands of litres of cool water, sitting there in case of fire. 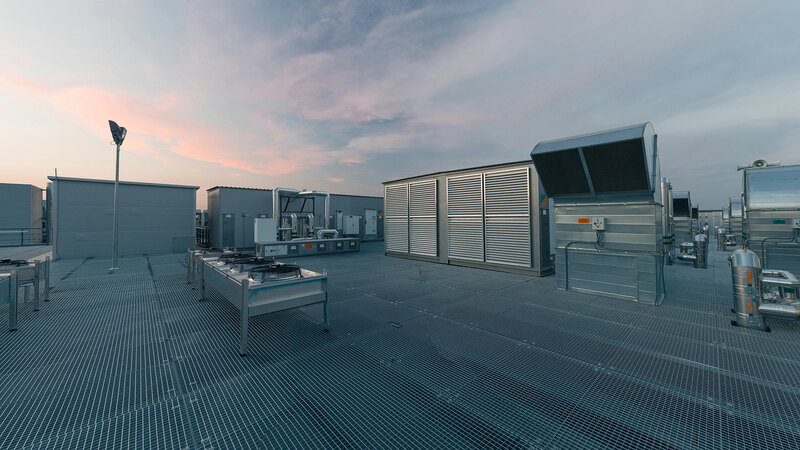 And up on the roof, to the sound of birdsong, is a football-pitch sized array of shiny aluminium ‘chillers’ that filter and cool the air going into the building. 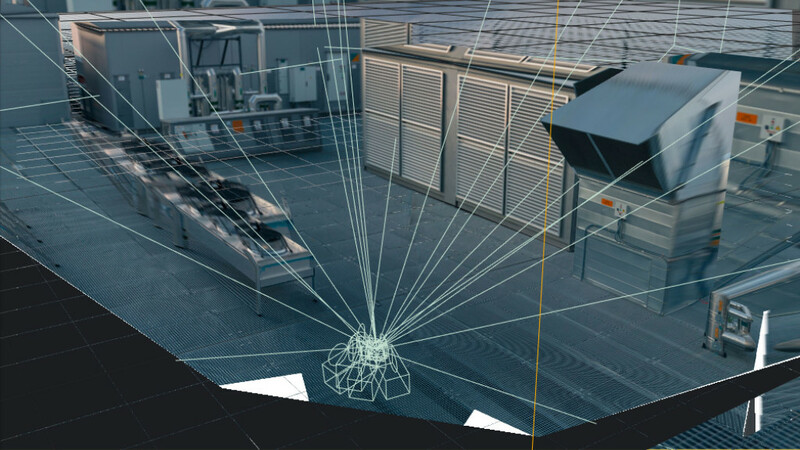 In experiencing these machines at work, we start to understand that the internet is not a weightless, immaterial, invisible cloud, and instead to appreciate it as a very distinct physical, architectural and material system. This was a particularly exciting project, a chance for an ambitious and experimental location shoot in a complex environment. Telefónica were particularly accommodating and allowed unprecedented access to shoot across the entire building, not just in the ‘spectacular’ server rooms. 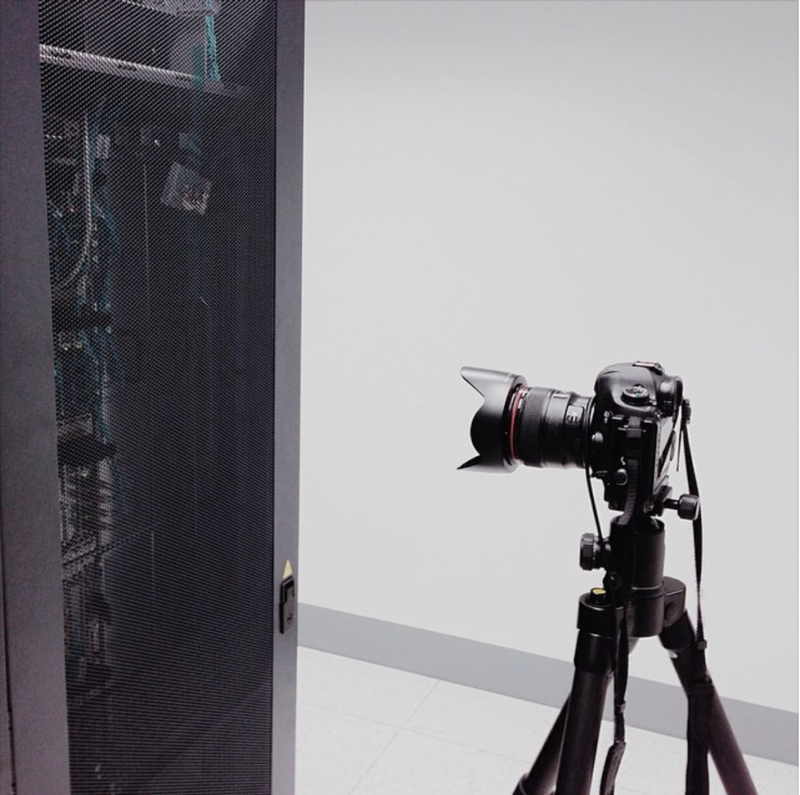 Thirty two locations were shot inside the data centre over the course of two days, followed by five weeks of post-production. I had to invent some new production methods to create a three-screen installation, based on some techniques I developed over ten years ago. The film was shot using both video and stills, using a panoramic head and a Canon 5D mkIII. The video was shot using the Magic Lantern RAW module on the 5D, while the RAW stills were processed in Lightroom and stitched together using Photoshop and Hugin. The footage was then converted into 3D scenes using camera calibration techniques, so that entirely new camera movements could be created with a virtual three-camera rig. The final multi-screen installation is played out in 4K projected across three screens. There are more photos available at Flickr. Internet machine is part of BIG BANG DATA, open from 9 May 2014 until 26 October 2014 at CCCB (Barcelona) and from February-May 2015 at Fundación Telefónica (Madrid). Internet Machine is produced by Timo Arnall, Centre de Cultura Contemporània de Barcelona – CCCB, and Fundación Telefónica. Thanks to José Luis de Vicente, Olga Subiros, Cira Pérez and María Paula Baylac. You HAVE to release the film online somewhere so we can all see. You could even make it a premium Vimeo film. Please consider this, it looks fantastic! You should have Netflix, Vimeo, or some other video provider distribute this amazing work. I saw the trailer and I am hooked. Listen to the sound of the Internet – FACT Magazine: Music News, New Music.